This month's instalment of Oribe's 100 Lines of Chanoyu is quite interesting from many perspectives. First, from a research perspective, lines 36 and 37 give us an insight into the evolution of chanoyu manuscripts. When one objet d’art is displayed in the alcove, two are arranged on the display shelf. When two objets d’art are displayed in the alcove, ensure the number of objets on the display shelf amounts to one. Between the alcove, tatami and the sideboard: Display utensils two places even one odd; or yet two odd one even. The Nampōroku text continues with an example of this: ". . . An example for the first session is: Alcove: scroll (1) Tatami: kettle or brazier (1) display board: incense container and feather sweep (2) ". The thinking in the Nampōroku is the same in terms of balancing odd and even numbers, but the thinking is more developed in terms of an additional area (the temae mat) for consideration. Current researchers have the consensus that the Nampōroku was written sometime in the Genroku Era (1688-1704). The fact that both these ‘100 lines’ and the Q&A with Oribe manuscripts do not include the temae mat for consideration with the shelf and alcove may further support the estimated date of the Nampōroku. Second, lines 41 and 42 show us historical forms of the temae that are all but discontinued now. When a chaire is displayed at a distance from the mizusashi, another utensil should be paired with the chaire. When (a chaire) is displayed at a distance from the mizusashi, one can comfortably display even three pieces. The cup of the hishaku (can be) placed on the board (at the foot) of the furo-saki window. Depending on the size of the chaire, when displaying utensils like this the hishaku should be paired with the chaire. When displaying just the hishaku and futaoki, the futaoki is placed three tatami weaves away from the rim. The hishaku handle is aligned with the middle of the futaoki, and two sun (6.06cm) should be between the end of the handle and the futaoki. The version of The Book of Oribe’s Chanoyu (Oribe Chanoyu-sho) published by Shibunkaku is a reproduction of the manuscript at the National Diet Library. This manuscript is a transcription, not the original manuscript, made in the mid Edo Period (1603-1868). All except one of the 70 diagrams in the manuscript are included in the Sōjinboku 草人木 (1627), an almanac of chanoyu teachings compiled from the central references of the day. 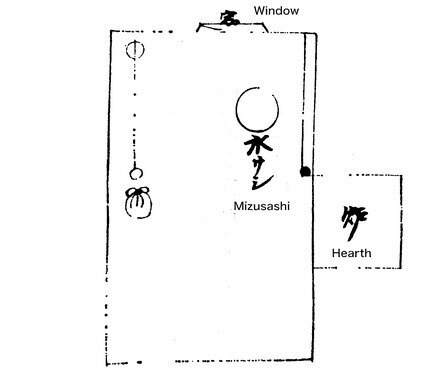 Though the explanations of the diagram in Oribe’s document differ from those in the Sōjinboku, it appears that The Book of Oribe’s Chanoyu was one of the most important references texts for the Sōjinboku 草人木. For the brazier, when displaying a single chaire before the brazier, one might position the chaire to the right. When displaying a single chaire before the brazier, whether on its own or paired with another utensil, wouldn’t it be fitting to position the chaire to the right? By the conversational tone both with line 47 and the line in the Kurita-shi document, it appears that Oribe is adding this line (and therefore his own opinion) into the lines he’s copying form Rikyu’s document. He seems to be suggesting the opposite of when the chaire is displayed in front of the mizusashi. Namely, that two thirds of the chaire is positioned to the right (guest side) and one third to the left (shimo/katte). To read the rest of this month's material, please head over to my Patreon. The 'Gyō' level will get you Oribe's 100 Lines of Chanoyu. The 'Sō' level will get you all the monthly translations, including the Question & Answer with Furuta Oribe 茶道長問織答抄 manuscript.